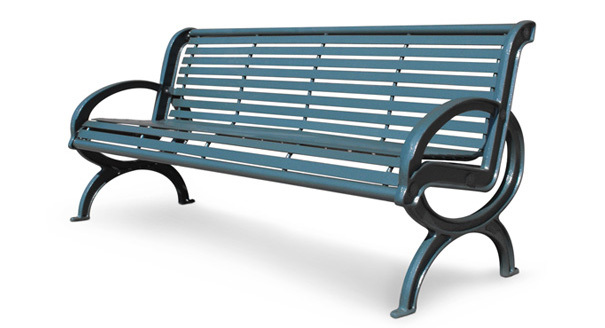 Boldly styled cast iron end frame with a rugged yet comfortable steel slat seating surface. Commercial modular design provides infinite add-on capability. Perfect fit for waiting areas, parks or any commercial locations. These outdoor benches can be portable or surface mounted using the pre-drilled mounting holes. Anchoring hardware is not included. The state of the art finishing process used on the bench combines the application of an 'Electrocoat Zinc Rich Primer' with a durable polyester powder-coat top layer to ensure every crevice and joint is completely sealed, providing full protection against	corrosion and weathering. Benches are finished in either a gloss or textured polyester powder-coat finish.